I got up early, when only Chinese tourists were wandering around town. I set out on my motorbike in search of a gas station. I had to ride all around town until I found one, but it wasn’t open. The second one was open, but didn’t have gas. The third one I found actually had gas. 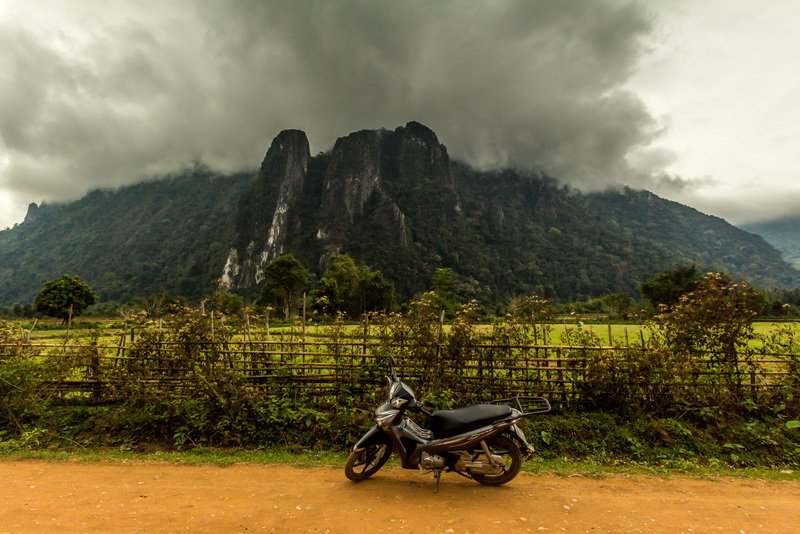 Vang Vieng isn’t the gas station capital of Laos like Phonsavan was. With a full tank I queued up behind the dune buggies and songthaew full of Chinese tourists waiting to cross the little toll bridge. Beyond the bridge the ride down the gravel road to the Blue Lagoon was spectacular, past dramatic limestone cliffs shrouded in clouds. And there was no traffic after the dune buggies sped off. On the way to the Blue Lagoon. Even though I arrived early at the Blue Lagoon, it was already full of Chinese tour groups, swimming, swinging, sliding, and ziplining. The lagoon itself was small and not impressive. I proceeded to the cave, which required a steep climb up sketchy steps. Inside it was impressively large. After I entered a large group of Lao university students came in. I could have went in further, but it was slippery, and I didn’t feel like falling, so I climbed back out. I rode on down the dirt road. There was nobody around. The Chinese tour groups don’t go beyond the Blue Lagoon, and the backpackers were still sleeping. 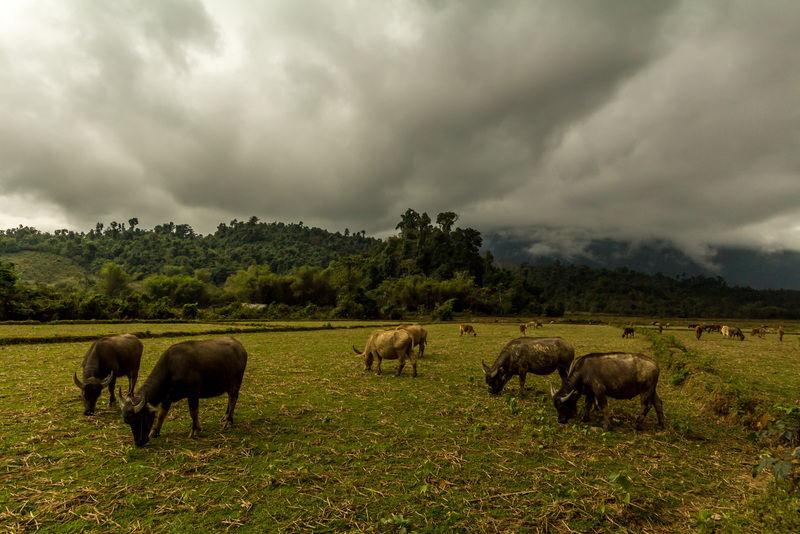 I passed through small villages and fields full of cows. The cliffs loomed. A walk in the fields. 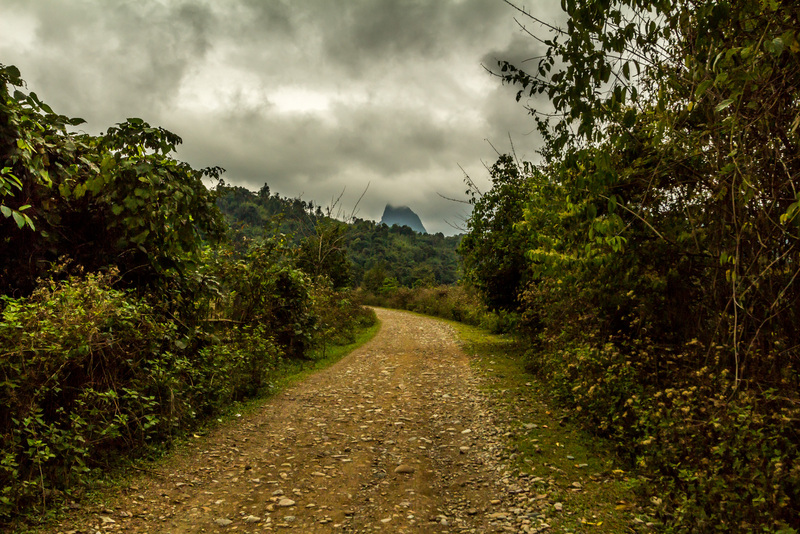 I eventually came to a small dirt road that led off the main dirt road. I followed the muddy little road for a while, and the scenery was even better. I was among the cliffs, and there was nobody around, not even locals. But the road became a muddy little path, with huge puddles of water. After exploring on foot a little, I headed back to the main dirt road. I followed this road in a big loop. I stopped at a simple restaurant for lunch. 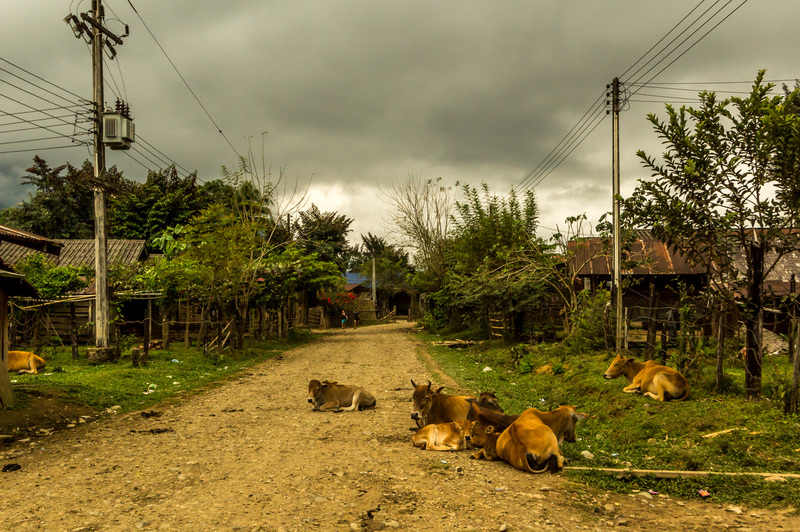 I like the idea of supporting the locals here, since most tourists just zoom by without stopping. Unfortunately, the instant noodle soup they served was terrible. At least it was cheap. 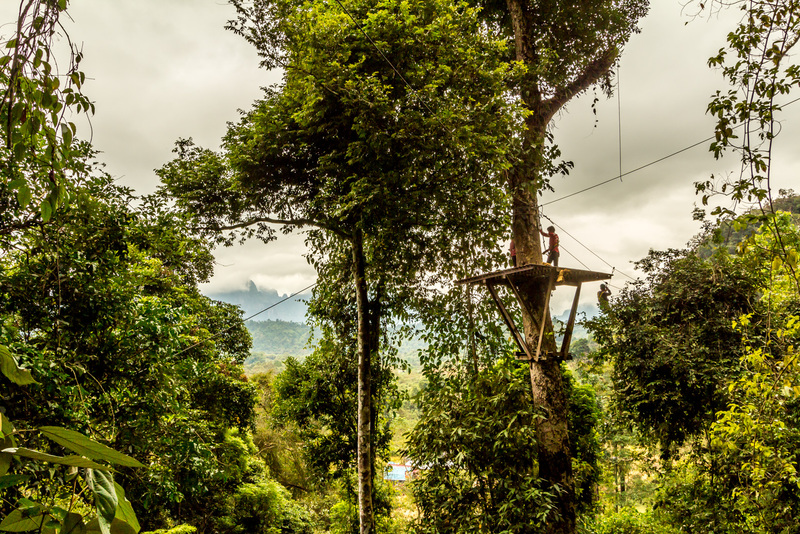 Ziplining at the Blue Lagoon. I rode through more small villages and past very basic temples. 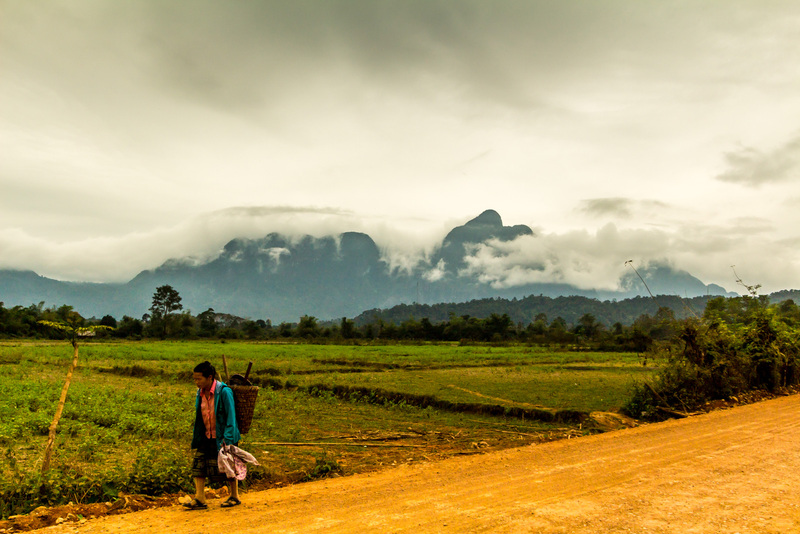 The temples are not impressive in Laos, like they were in Cambodia. The scenery was not as good on this stretch. The road got worse, and passed a Chinese quarry. Trucks were coming and going, throwing up clouds of dust. 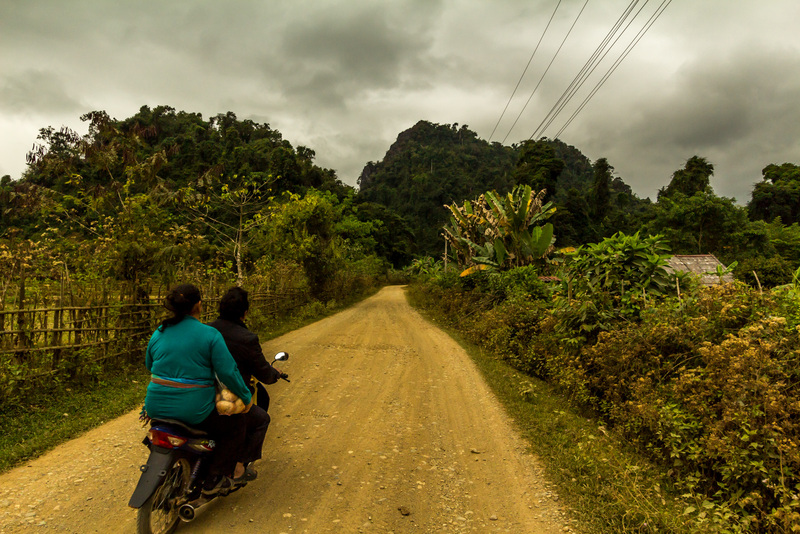 I eventually came to Route 13, which I followed back to Vang Vieng. 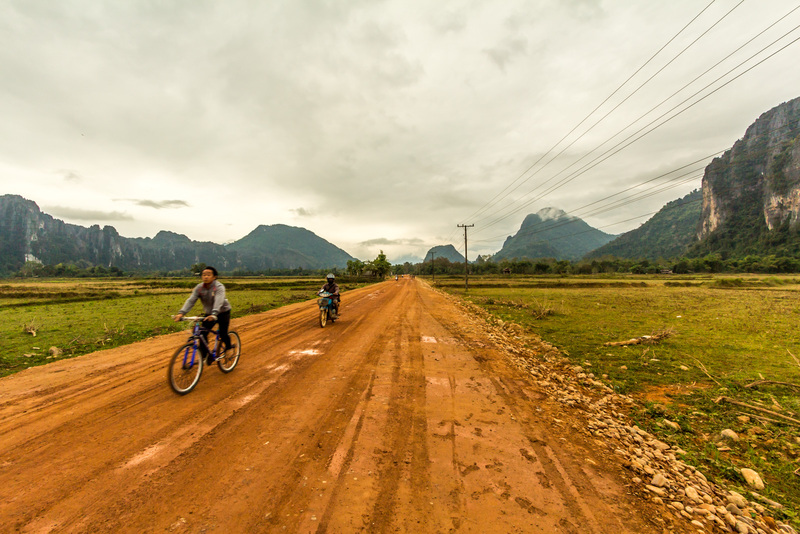 I rode on the old airstrip, which was used in America’s secret was to drop bombs on the North. It’s a parking lot now. 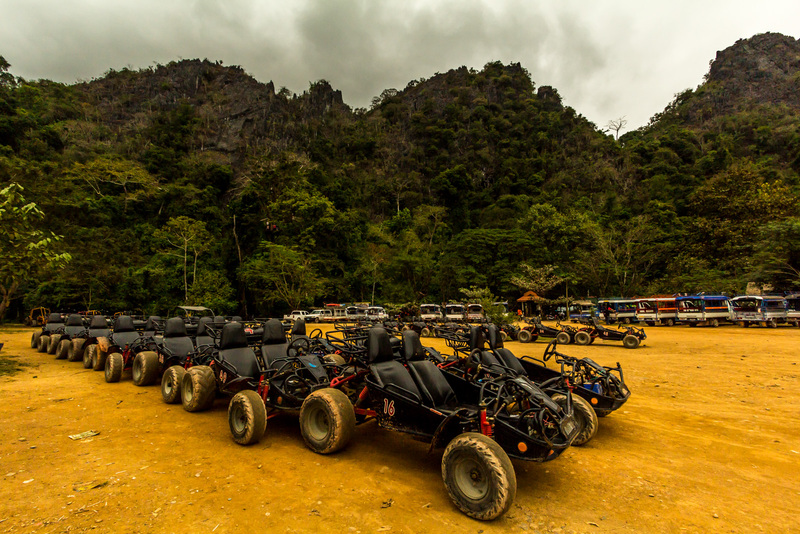 Dune buggies at the Blue Lagoon. 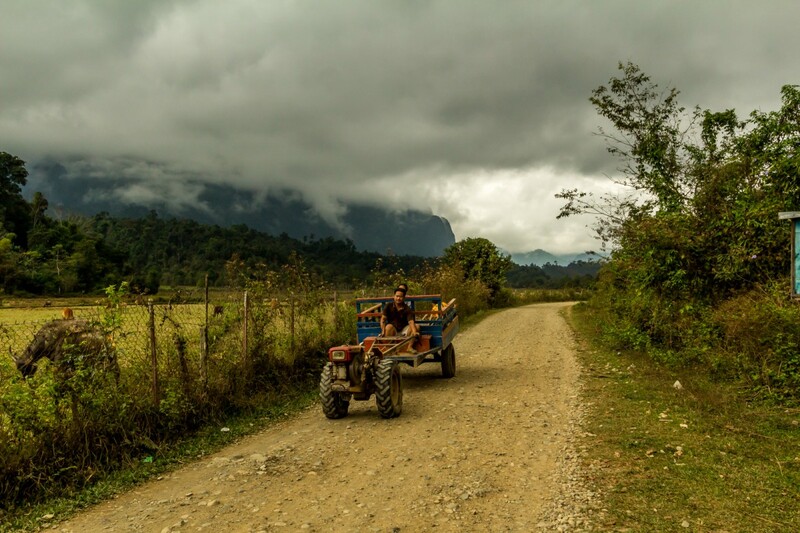 Vang Vieng reminds me of backpacking on the islands of southern Thailand more than a decade ago. It is still like that here. There are “same same but different” restaurants with the world’s most inattentive waiters. There are banana pancake ladies. There are dingy bungalows. But now there are more Chinese than backpackers, and they aren’t interested in those things. The Chinese are interested in zip lines, balloon rides, dune buggies, water parks, and big concrete hotels. So that’s what the locals are providing. There’s more to see beyond the lagoon. Cows taking some time out of their busy schedules. Nobody rides as far as I did off the main road. 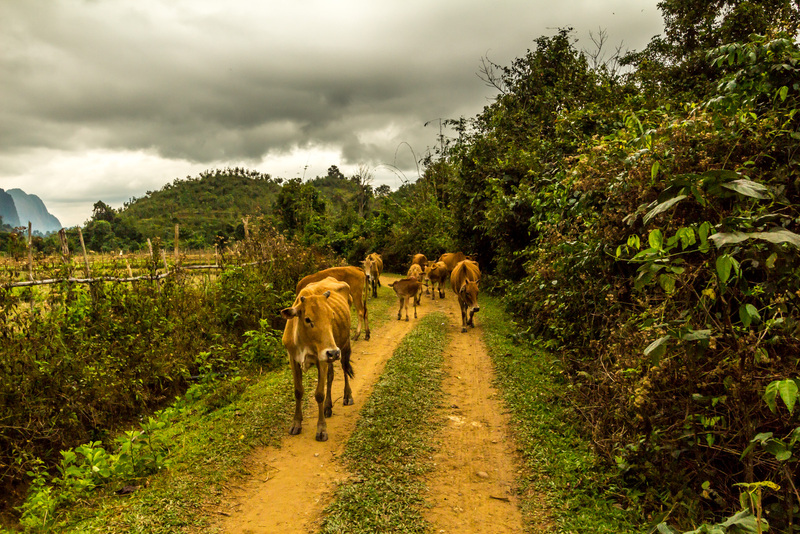 The cows are coming home. 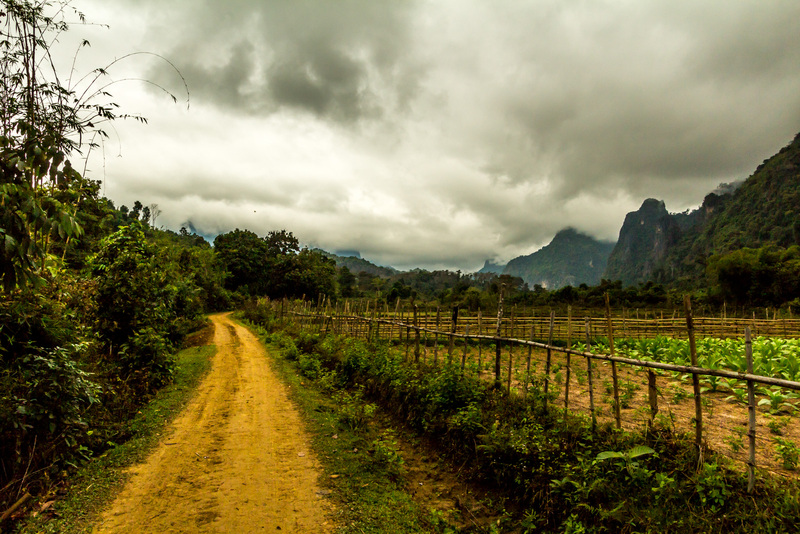 The Vang Vieng countryside is fantastic. 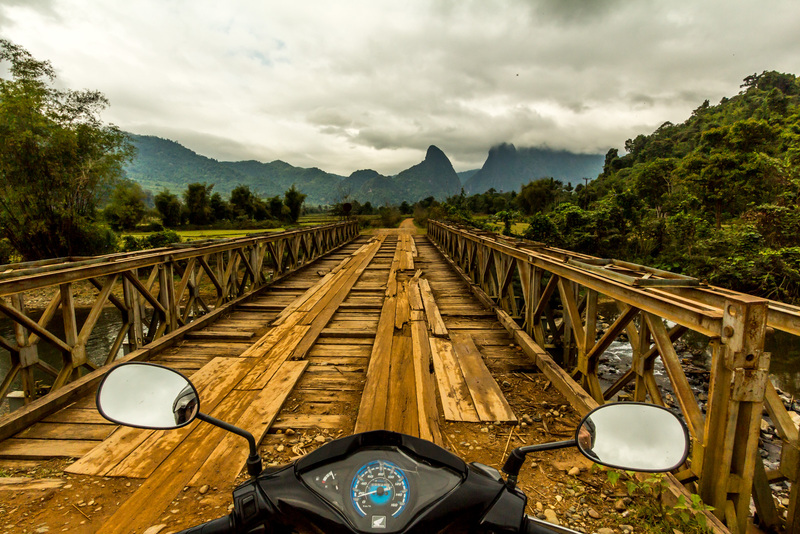 « Vietnam To Laos Day 17: Down, Down, And Down! 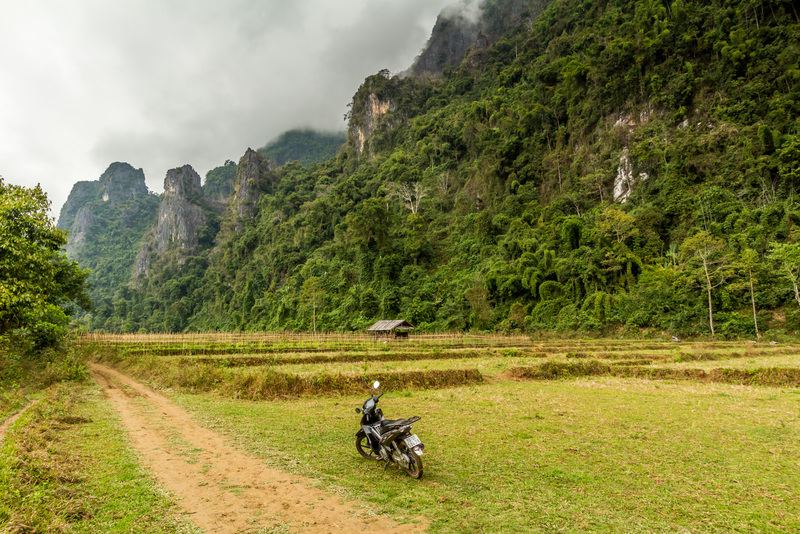 ← Vietnam To Laos Day 17: Down, Down, And Down!